Dr Kosmidis received his medical degree from the Medical School of Athens University in Athens , Greece . He completed his training in Internal Medicine at Sinai Hospital in Detroit , Michigan , U.S.A. (1976). He served as a Fellow in Hematology – Oncology at Wayne State University and Henry Ford Hospital , both also in Detroit (1976 – 1979) . 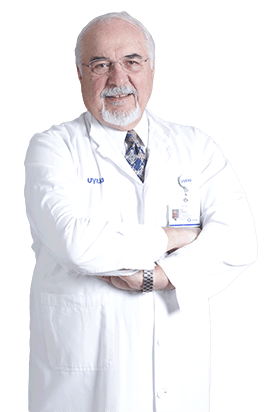 He is American Board certified in Internal Medicine , Hematology and Medical Oncology , as well as European Board certified in Medical Oncology. Dr Kosmidis is a founding member of the Hellenic Medical Oncology Society , as well as the Hellenic Cooperative Oncology Group, the Hellenic Foundation for Cancer Research, the Hellenic Society of Gastrointestinal Oncology and principal investigator in major studies both in Greece and abroad . He is the author or co-author of several books and articles in leading international oncology journals . He serves at the Editorial Board in many oncology journals of the world. Prior to his current position, he received appointments to serve as Head of the Second Department of Medical Oncology at St Anargiri Cancer Hospital in Athens (1981 – 1985) and at “METAXA” Cancer Hospital in Piraeus (1985 – 1997). Dr Kosmidis has been awarded by the Academy of Athens twice. Dr Kosmidis has been awarded by many Oncology Societies worldwide and he is honorary member of ESMO and the Italian Medical Oncology Association. Dr Kosmidis was the President of the 23rd European Society of Medical Oncology (ESMO) Congress in Athens, 1998 and was elected as the Chairman of The National Representative’s Committee in ESMO . Dr Kosmidis has been the President of the European Society of Medical On-cology for the years 2004 – 2005. Since 1st of January 2006 he has served the society from the position of Past-President. He was also the Chairman of the ESMO Foundation up to December 2007. Dr Kosmidis was the President of the Scientific Committee of “HYGEIA” Hospital. VASCULAR ENDOTHELIAL GROWTH FACTOR POLYMORPHISMS AND CLINICAL OUTCOME IN PATIENTS WITH METASTATIC BREAST CANCER TREATED WITH WEEKLY DOCETAXEL, Koutras AK, Kotoula V, Papadimitriou C, Dionysopoulos D, Zagouri F, Kalofonos HP, Kourea HP, Skarlos DV, Samantas E, Papadopoulou K, Kosmidis P, Pectasides D, Fountzilas G.Pharmacogenomics J. 2014 Jun;14(3):248-55. doi: 10.1038/tpj.2013.36. Epub 2013 Sep 24. INTACT OR BROKEN-APART RNA: AN ALTERNATIVE CONCEPT FOR ALK FUSION SCREENING IN NON-SMALL CELL LUNG CANCER (NSCLC) Vassiliki Kotoula; Mattheos Bobos; Maria Vassilakopoulou; Eleftheria Tsolaki; Sofia Chrisafi; Amanda Psyrri; George Lazaridis; Kyriaki Papadopoulou; Ioannis Efstratiou; Catherine Michail-Strantzia; Larisa V Debelenko; Paris Kosmidis; George Fountzilas Appl Immunohistochem Mol Morphol. 2015 Jan;23(1):60-70. doi: 10.1097/PAI.0000000000000028. DOCETAXEL AND INTERMITENT ERLOTINIB IN PATIENTS WITH METASTATIC NON-SMALL CELL LUNG CANCER; THE DOPERLO STUDY FROM THE HELLENIC COOPERATIVE ONCOLOGY GROUP Karavasilis Vasilios, Paris Kosmidis, Kostas Syrigos, Meletios A. Dimopoulos, Vassiliki Kotoula, Dimitrios Pectasides, Ioannis Boukovinas, George Klouvas, Christos N. Papandreou, George Fountzilas, Evangelos Briasoulis Anticancer Research, 2014 Oct;34(10):5649-55. INTACT OR BROKEN-APART RNA: AN ALTERNATIVE CONCEPT FOR ALK FUSION SCREENING IN NON-SMALL CELL LUNG CANCER (NSCLC). Kotoula V, Bobos M, Vassilakopoulou M, Tsolaki E, Chrisafi S, Psyrri A, Lazaridis G, Papadopoulou K, Efstratiou I, Michail-Strantzia C, Debelenko LV, Kosmidis P, Fountzilas G. Appl Immunohistochem Mol Morphol. 2015 Jan;23(1):60-70. doi: 10.1097/PAI.0000000000000028.